My Laser Boyfriend: Experiments with light. This week I stumbled upon Veritasium, a video blog featuring experiments and explanations about various topics in science and nature. The host and creator Derek Muller, who has a Ph.D. in Engineering Physics, aims to communicate sometimes abstract scientific concepts to the public in an interactive and easy to understand way. This is a GREAT video he put together demonstrating Thomas Young's double-slit experiment. When Young first presented his results of his experiments to the Royal Society of London in 1803, he explained: "...(it) may be repeated with great ease, whenever the sun shines, and without any other apparatus than is at hand to every one." The property of light that this experiment so elegantly demonstrates is it's distinctly wave-like. It has properties of waves, such as a wavelength (or color) and it can constructively and destructively interfere with itself, like ripples in a pond. In the early 1800's, this idea was very revolutionary, as it was commonly believed that light behaved more like individual particles, thanks to pioneering work by Isaac Newton in the 1600's. 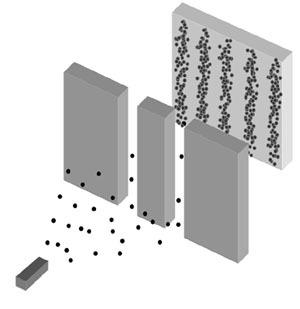 Double slit experiment showing small particles, such as individual electrons or photons, passing through two slits will cause an interference pattern, a property of waves. Isn't that crazy? Yes. It is. Because quantum mechanics is totally bonkers, but that's why it's so interesting. Turns out Young and Newton were both right. As Albert Einstein discovered 100 years later in the early 1900's, light can behave both like a wave and a particle, and this particle can only have only a discrete set of energies, or quantized energies. Today, we call these discrete quanta of energies photons. Einstein's work describing the photoelectric effect -- in which you can shine light at a metal and get it to conduct electricity -- won him the Nobel prize in 1921. 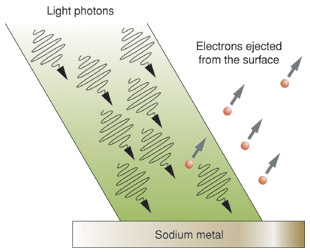 The photoelectric effect: If you shine light, made up of photons of specific energies, at a metal material, the light will excite the electrons in the metal and cause them to eject from the surface. The idea of photon-electron interaction is an important piece of the quantum mechanics puzzle. The so-called wave-particle duality is one of the main concepts of quantum mechanics and is essential in understanding how semiconductors and solid-state light emitters work. Of course, quantum mechanics gets very dense and abstract very quickly, and details of it are still being discovered to this day. Still, it's fascinating to think about how simple experiments like sunlight passing through a double-slit were so influential in developing our understanding of light and matter.